Today, we are pleased to announce the release of new TSI developer tools, including an Azure Resource Manager (ARM) template, API code samples, and easy-to-follow documentation for developers. TSI’s developer tools will shorten the time it takes to get started developing. Using these developer tools, customers can more easily embed TSI’s platform into custom applications to power charts/graphs, compare data from different points in time, and dynamically explore trends and correlations in their data. As organizations transition their go-to-market and business models from selling devices to selling services, they are developing companion applications that provide operational insights and analytics to their customers. Much of the data required to power these applications is time series, but large volumes of time series data can be very challenging to store and query. Time Series Insights (TSI) takes the burden of time series data management away from these organizations, and TSI’s platform capabilities enable developers to build applications that provide valuable insights to their customers. Time series data at IoT-scale can lead to high latency and long rendering times when querying traditional databases. Many customers have told us that it’s easy to hang a client application when you need to search across billions of time series events, and they’re right – doing real-time with time series data is tough. Moreover, many of our customers don’t want to hire an army of engineers to manage a backend, they would rather invest their resources into building their core product. TSI is purpose-built for time series data and is optimized for reads and throughput so that you can query your data on the fly. Applications built on top of TSI can dynamically visualize and query data from all over the world in real-time by taking advantage of built-in capabilities like aggregation and tumbling window interval processing. TSI is an SLA-backed, fully managed service, so there’s no need to hire a team of engineers to manage your data. Additionally, it scales with you, so as your application grows in usage, your database and querying engine do as well. We previewed these developer tools with several organizations who expressed interest in using Time Series Insights as a platform. 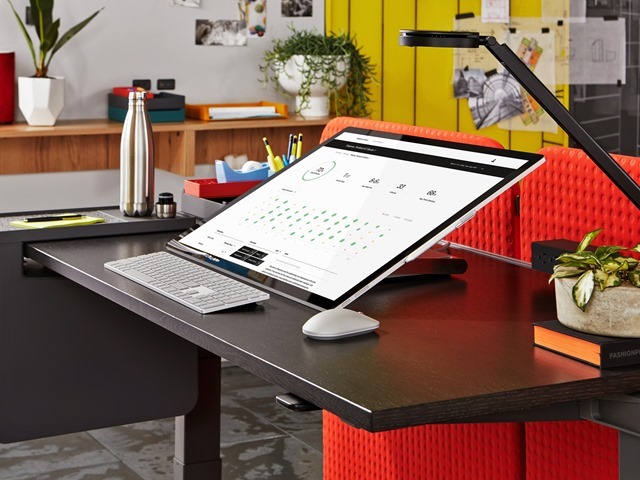 One of the companies, Steelcase, just released the Steelcase Workplace Advisor using TSI’s developer tools. The Steelcase Workplace Advisor uses time series data to help their customers measure and improve the effectiveness of the workplace in near real-time. An Azure Resource Manager (ARM) template that automates managing environments, access policies, event sources and reference data. An ARM template is a JSON file that defines the infrastructure and configuration of resources in a resource group. To perform operations on Azure TSI resources, you send HTTPS requests containing supported parameters with the ARM template. You can also use the PowerShell command line to pass these Azure resources parameters. Documentation to go along with both, helping developers to understand what they need to do to get started, the process of using ARM and our APIs, and frequently asked questions. 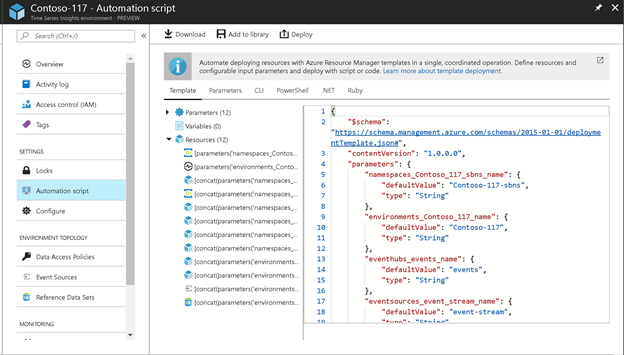 You can access the new ARM template in the Azure portal under the automation script blade or on management documentation page. You can find related documentation here. Below is a screenshot of the automation script blade in a Time Series Insights environment within the Azure portal. You now can easily download your ARM template to programmatically deploy it or add it to your library for later use. Thanks for building on our API platform. We’re excited to see what you develop on top of Time Series Insights. We’ll continue to invest in tools that make it easier for developers, but if you have anything specific in mind, don’t hesitate to drop us a line at tsipmteam@microsoft.com.